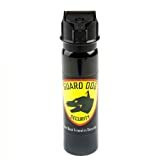 The Guard Dog flip-top pepper spray contains 18% OC (Oleoresin Capsicum or known as "red pepper") and invisible UV dye in the quickest release pepper spray on the market. The Guard Dog pepper spray is used with the highest grade formula and laboratory tested for no-leak and optimum efficiency. The convenient and effective, top allows you to swiftly slide your finger underneath the safety and press for the hottest spray available for consumer use. 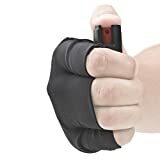 Powerful Concealed Self-Defense for Women This stun gun for women may appear to be a cute mini flashlight, but believe us, it is so much more! Featuring Guard Dog’s exclusive Concealed Inner Stun Technology, the flashlight body hides a powerful, high voltage stun gun which produces a maximum milliamp jolt and a massive sound that will make potential assailants regret they messed with you. Packing a blindingly bright, high intensity 200 lumen light that will illuminate the darkest alleys or blind an attacker, the enhanced CREE bulb is the brightest light available in a mini stun gun and lasts up to 100,000 hours. Compact, Sleek, Every Day Security The Guard Dog Ivy is the sleekest and sexiest self-defense stun gun ever designed – perfect for every day carry. Measuring just 5.56 inches x 1.125 inches, the Ivy stun gun for women fits into your purse, luggage, pocket or hand, increasing your confidence during night jogs or negotiating dark parking garages. The smooth, rubberized handle wrapped around the tough, durable type III aircraft grade aluminum body provides a firm yet comfortable grip, while the sleek lines and bright colors make it an elegant and feminine accessory. Convenient, Reliable and Rechargeable Protection An easy to access on/off safety switch is prominently featured on the bottom of this small stun gun for women, preventing kids or others accidently discharging the device. 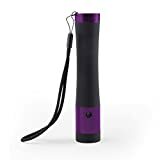 You will also save money and never get caught without batteries because the Ivy stun gun flashlight is completely rechargeable and comes supplied with a charging cord. Guard Dog Ivy Stun Gun for Women with Flashlight Features The most inconspicuous stun gun on the market Sleek, compact, pocket-sized design Bright 200 lumen flashlight Up to 100,000 hours bulb life 5.56” long Rechargeable battery Includes charger The Best In The Industry Guard Dog's exclusive Concealed Stun Technology brings you functionality that is truly practical. 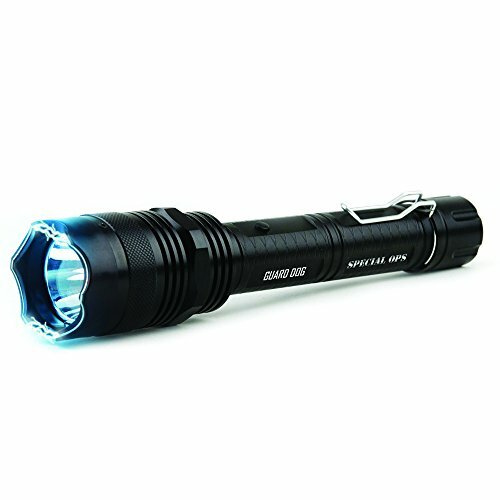 With no visible prongs on the top of our unique flashlight stun guns, your security device is fully concealed until use. Don't trust your security with cheap knockoffs, Guard Dog's Concealed Stun Technology is the best in the industry. Safety is no accident. Buy your Ivy Stun Gun Flashlight today!